Prototyping is defined as the act of creating, testing and trying a new idea; then reworking that idea based on what is learned from the experiment. A prototype is an original model or concept from which a product, object or even system is formed. It is a platform for experimentation, for learning, and for iteration that can lead to breakthrough change. 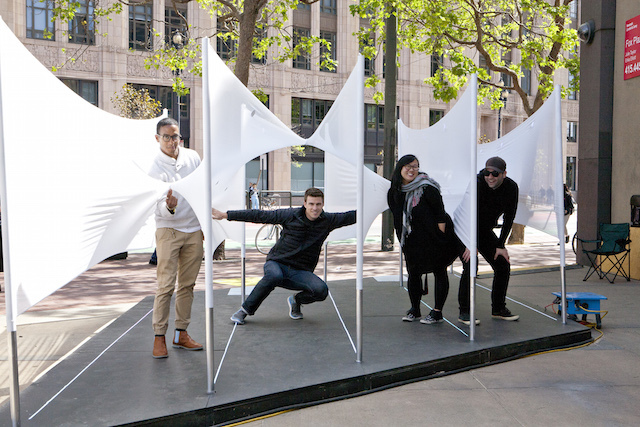 With the Market Street Prototyping Festival, we set out to create a space for this kind of experimentation in the public realm. We wanted to instigate new ideas for street and public life and we wanted to spur new ways of thinking about who gets to participate in determining the nature of a changing city. The success of this work has inspired a prototyping culture in San Francisco evidenced by experiments in other neighborhoods like Playland at 43rd Avenue and Sound Commons at United Nations Plaza. This prototyping culture is also growing through much deeper collaboration between Yerba Buena Center for the Arts, the San Francisco Planning Department and other city agencies and organizations that are working to make the city more inclusive, more livable, and more inspiring. Leading up to and during the festival, we worked closely with Gehl Studio to conduct an evaluation and analysis to connect this work to the goals of the Better Market Street Project and to better create diverse, integrated public spaces that support civic life. We also interrogated prototyping as an effective engagement and planning tool. We used baseline data, festival counts, intercept surveys, in-depth interviews, and social media to help us learn. You can read the full Gehl report here: http://bit.ly/22NGgA8. We can make the street, in and of itself, a destination. People not only came to Market Street, they stayed, they played, they strolled, and they interacted. In addition to celebrating the street as a destination, the Market Street Prototyping Festival made it very easy for people to happen upon it in the context of their daily lives. According to Gehl, lingering activities increased by as much as 700% during the festival and pedestrian counts were up more than 30% on average during the Festival. A tapestry of design elements will result in more and different kinds of people engaging in an active and connected street life. Design principles to consider: include activities that are accessible and appealing for people of all ages and abilities; weave in options for physical activity, play and entertainment; include moments for contemplative individual experience and collective interaction; and ensure flexible seating and amenities that, by design, encourage connection and exchange between people who don’t know one another. We can cultivate civic engagement in our streets by including active program and opportunities for people to speak out and voice their opinions. We learned that the street can be a stage, a classroom, and a place to tell your story or voice your opinion. In addition to designing for these activities, we learned that strong partnership with community-based organizations, artists and stakeholders is essential. These partnerships will not only aid in good design but in authentic program that incorporates local context. We can bring new and needed services to our streets that make people’s lives better. We prototyped places that allowed for relaxation and contemplation. We experimented with public bathrooms and with street libraries. We prototyped systems for sharing important emergency preparedness information. These projects propose radical ways of thinking about how our streets can serve as the civic commons – especially in collaboration with city agencies and neighborhood service organizations. Prototyping builds capacity in the community. The Market Street Prototyping Festival cultivated the design and engagement capacity in the community. People shared resources, ideas, and expertise. Design experts benefited from neighborhood knowledge. People who had never designed and built a project gained access to previously inaccessible experience, resources and facilities. The Planning Department leant its weight and its understanding of city code and permitting processes. YBCA assured that art and creativity were central. In short, we were much greater and more impactful all together than we would have ever been working in our own territories and silos. A prototyping culture is a learning culture. Inherently, prototyping is about listening, learning, responding. Not only can we design better places through this work, we can ignite the public imagination and inspire broad-based citizen engagement that we haven’t motivated through our typical planning processes. We invite you to imagine a movement where cities everywhere commit to and thrive on this kind of inclusive culture of learning and responding.